Don't know if Ghost recon Wildlands open beta counts, but this game has really impressed me actually. I encourage you all to try it out. It has certain Red Dead feel to it. @Ringedwithtile Out of interest, is your distaste for player empowerment localised to DOOM and other particular franchises, or more overarching? @J_K_Day It's more overarching for sure. When a game is so self-conscious, so trying to please, it bothers me. It's like a clingy girlfriend that wants to sweet talk. There's something desperate about it. Franchising in general bothers me, especially when games are so conscious of what the public perception of their legacy is, or when concept isn't something that's elaborated on, but restated---which I think it is in DOOM's case. Hyperdimension Neptunia Re;Birth2 Sisters Generationbolded (for PC) - did almost everything there is to do. That means a lot of grinding, which is still fun. The game is just stupidly light-hearted but one of the endings (“conquest”) was kind of dark and cruel and with that quite hilarious. But now I need a break before I start rebirth 3. Batman Arkham Knight 9/10. Everything said about the game is true so i'll concentrate on the dlc. The seperate episodes featuring the bat family are too short to matter but the Season of infamy which adds 4 long side missions in the main game featuring 4 fan favorite villains of past games. Best mix of gameplay and story in the franchise and worth it if you haven't played it. Movie Batmobile tracks were also quite fun especially the Burton ones. Played the pc version and had 0 issues. Need for Speed 7/10 Serviceable NFS reboot. Always online makes for some great open world moments like drifting counter to another player but it could lead to disconnections. Story is abysmal and gameplay doesn't surprise so you're better off playing better titles like Forza Horizon, NFS Hot Pursuit, Burnout Paradise. Playing the latter beforehand made that reality all the more apparent. I had a blast just running around that city. No matter what my current objective was when I saw a dash, delivery, ect. nearby I always do them. I can easily say that I positively only played the game because I enjoyed the gameplay and at no point did I wonder or care about what is going to happen next in the story. There was one time that I had to complete the next story mission because Noah would not shut up about making a deal with Dogen and how Dogen has a restaurant. He would literally tell me that after every side mission I did it drove me insane I just had to advance the story to shut him up. I'm also not the biggest fan of the progression of gear and not having access to them all from the start, at least the traversal gear. There were dashes I tried over and over and just couldn't get 3 stars on until I eventually decided to look up what route people we taking and disappointed that it was pretty much impossible for me until I advanced far enough in the story. With that I would suggest if anyone were to play it that they should progress enough to get the second magrope upgrade, which takes you up. Then you pretty much have access to all of the important stuff for running around the city. Overall I loved this game but do think it deserves the mediocre reviews it got. Its been a while since I've played this and I really enjoy it. Exploring the mansion is fun and I love how there is a button for just calling out for Mario, which serves no actual purpose. I also love how Luigi will whistle the Luigi's Mansion theme. All of these details make wandering around the mansion a blast. I really wish you could skip cutscenes though, specifically the ones going into the final fight. While learning how to take him out and dying a couple of times watching those scenes got old real quick. Also spawning without full health is a slight annoyance. I've decided to try something new when it comes to finishing games. One part is to better understand why I enjoy the games I play to completion. The other part is to flex the game design muscles in my brain in a non-taxing way. So I'm making rough notes with a slant towards game design once I'm done with a game. The notes are fairly surface level but might contain the odd spoiler just to warn folks! Stuff in bold is new. Did I "Finish" it? : Yes! - Reached the credits and I've done the post game stuff that I liked the look of. No more HMs! The bane of the franchise is gone and in its place is the Poke Pager system which also makes getting around the environment fun once again. Ditching grid based movement and having a more realistic character model scale also helps the game a lot and works toward making the world seem more alive. The Island Challenge system is a great alternative to the Gym system and its focus on variety leads to some fun scenarios. Some of the new Pokemon designs are inspired & Alola forms for older Pokemon breath new life into them while having all sorts of implications for the future of the franchise. The difficulty curve for the game could really do with tweaking. Playing with EXP. Share on is too easy. Playing with it off is inconsistent and overly grindy. Have more detailed/better in game guides for Pokemon's more obtuse and complex systems (breeding, IV/EV levelling etc.) so much of the QOL upgrades in this game go a long way to surfacing the more hidden parts of the Pokemon formula but I think a bit more could be done. Have No-Exp battle tournaments and systems more readily available at multiple points in the game rather than just in the end-game. This could also be pushed as an alternative way to boost Pokemon stats. Build on the boss battle-like Totem Pokemon battles and have "proper" boss battles in narrative sections. The game even teases this and drops it at the last possible moment! What is the core of the game? Provide a fresh and exciting Pokemon experience for fans old and new. Refresh and/or replace the tired and out dated game systems/mechanics. Keep the core loop intact with all changes and additions working towards enhancing it rather than detracting from it. Tell a more detailed and nuanced narrative to previous Pokemon titles. In short: Mix things up! What did the game mean to me? A Pokemon game that is up there is GEN I & II. A surprisingly entertaining and at times complex story. Had that familiar Pokemon feel that I love but the changes and additions really do breath much needed new life into the franchise. 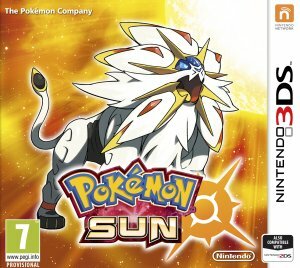 Still has some glaring inconsistencies and pacing problems particularly on the game's last island where it feels like Game Freak dropped the ball compared to the rest of the game. You can teach an old dog new trick and still be true to the core of the game. @thenerdtheword That's a cool initiative, thanks for sharing! Could even make your own thread with those. Finally finished Xenoblade Chronicles, clocking in at about 110 hours spent in that world. It's was a magnificent journey that I won't soon forget. It's nice to have levels transfer over into NG+, since that will allow me to replay it quickly someday and go from main story beat to main story beat. Nice to see Ben starting it up as well. I finished up Dark Souls 2 SotFS tonight and overall I really liked it. I can see where some of the criticism came from and I agree that maybe they went with quantity over quality in some places. A lot of the areas weren't super memorable and were pretty linear for the most part. I didn't appreciate the reducing health bar and I thought the difficulty spike at the beginning was pretty ridiculous (though I joined the champions covenant first thing without realizing it made the game harder).. I thought the bosses were far easier than any of the other games but I enjoyed them quite a bit. There were some cool designs and they mixed it up a lot with some of them. I appreciate some of the risks they took and had a lot of fun playing through it. Now I just have Demon's Souls and my journey will be at an end..
@Faaip Demon's souls is still a great time it isnt as timeless as the others but still great. There are somethings the arent present in the Dark Souls games (like only being able a certain amount of items ) and the tenancy system which ill let you figure out on your own. Demon's souls has some of the best NPCs and probably the best level and boss design in the series. The amout of equipment is also a fraction of the other games. @Faaip i look forward to hearing your reactions on the game. @FF7Cloud I'll definitely post about it! Suikoden II - I completed Suikoden for the first time at the beginning of last year and after starting 2, I put it down for some reason. Finally got back to it over the last few weeks and like the original game I loved it. Most people are pretty adamant that it's easily better than 1 but maybe it's just cloudy memory but I didn't think it changed too much from the original game that made me think it was a clear improvement. It still has my favourite type of quick turn based combat, recruiting people and growing your castle is awesome, the characters are really good and the world is well realised so I loved it as much as 1 for sure. My main critic is I think the story is a bit silly and it didn't really make any sense why the war continued on after a certain point. Anyway, still absolutely great and that 'good ending' is a pretty nice way to finish it. Oh.. also meeting and fighting alongside characters from your save of Suikoden 1 is really cool. It's also very cool when you meet your character and seeing the npcs react to both of you having the same name. Cool touch. VVVVVV - So since I finished Suikoden 2 and still had plenty of time left on my bus trip, I went back to this after putting 5 minutes into it and thinking it was a cool game. Like a more open Super Meatboy in terms of that game where you're going to die a lot and keep retrying until you get it. It's only about 2 hours long but it's super addictive and I really had a great time with it. The trophies are a bit insane though, bronze trophies for really difficult things.